Selecting the perfect paddle board at the first instance may not be an easy task for a lot of people, especially for the beginners. This is due to the fact that there are numerous inflated paddle boards available in the market and it keeps on increasing day by day. Apparently, it seems that many models are identical and thus while selecting the inflated SUP's, there are a few factors that need to be kept into consideration. Firstly, while looking for inflated paddle board, the dimensions must be considered. The dimensions include length, thickness and also the width of the board. The people who are interested in paddle sports must keep their mode of usage, workouts, conditions of water and also the physical aspects in consideration. The selection of paddleboards must be done considering the height and weight of the person. Secondly, look out for longer boards as they have much more stability, especially while moving across a straight course. This is good for beginners and even moderate surfers. The longer boards have more volume and displacement capacity which provides stability for the beginners. On the other hand, it is better for the experienced personnel to select the shorter paddleboards which have less displacement. These are helpful in turning and maneuvering. 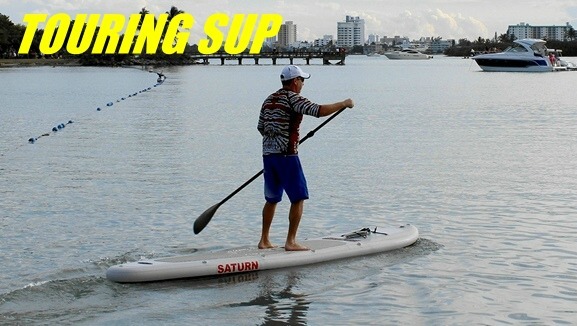 For those who desire for wave surfing, a high performance Saturn paddle board is best suited for them. The shorter paddle boards have less displacement and respond faster while turning. However, caution must be taken because taking very small paddle boards makes it difficult to control the speed and twists during the intense waves. Unless you are a highly experienced wave surfer, it is advised to avoid the smaller ones. Make sure that you opt for looking at several models before finalizing one. It will be a suitable choice for those to grab a flat water shaped style board on calm lakes or rivers. The majority of riders are making use of SUP's for many other recreational purposes like exercise, yoga and also fishing. The larger boards within calm water provide a perfect experience of paddle sports. The benefit of using larger boards is that people of all ages can use them quite easily within flat water conditions. They are also suitable for multiple riders as well as for family riding. For the competition purposes, it is better to use hybrid paddle boards. This is because they have less displacement, are lighter and are more agile while moving through twists and turns in water. In competitions, it is really important to select the size properly as the right size will determine the performance level. In conclusion, keep in mind how you plan to use the SUP's and make sure regarding the size, experience, performance factors and all the other relevant factors that are vital for you. Compare prices for different SUP paddle board brands. You can sort by different parameters.